Next week is Cinco de Mayo, and I love any excuse to eat Mexican food- whether it’s authentic or Americanized ;). And one of my absolute favorite dishes ever is nachos. I mean, talk about comfort food! I don’t think nachos ever doesn’t sound good. And the best part- there is SO MUCH you can do with the nacho concept! It doesn’t just have to be chips and cheese- they can be loaded, healthified, or even sweetened! Let’s talk about some of these yummy options ;). My family’s favorite version is pork nachos. Costa Vida and Cafe Rio are two of our favorite places, and their pork nachos are amazing! So we try to copy it at home ;). 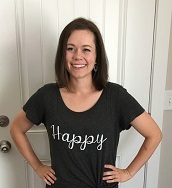 Even if I don’t have the actual copycat pork on hand, I always have some pulled pork in the freezer (I just cook it in root beer to give it a little sweeter flavor), and so all I have to do is pull that out and defrost it! Then we layer the pork with chips on a sheet pan and bake it with cheese sauce and shredded cheese; once it’s done we add tomatoes, avocado, olives, and sour cream and I have an easy dinner that’s perfect for movie night and that I know everyone will eat. You could easily add jalapenos, cilantro, guacamole, or substitute the pork with steak, chicken or ground beef. I love the versatility of nachos ;). 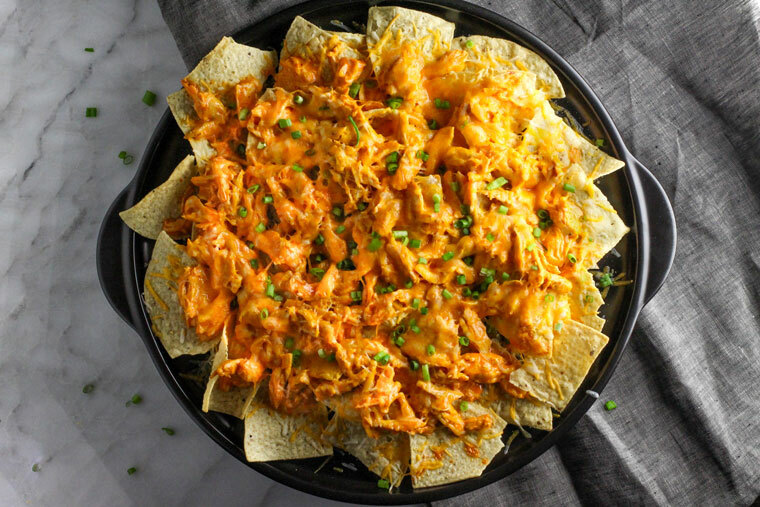 Of course, there are so many other ways to nacho! For starters, who says other cultures can’t have claim to the nacho name? 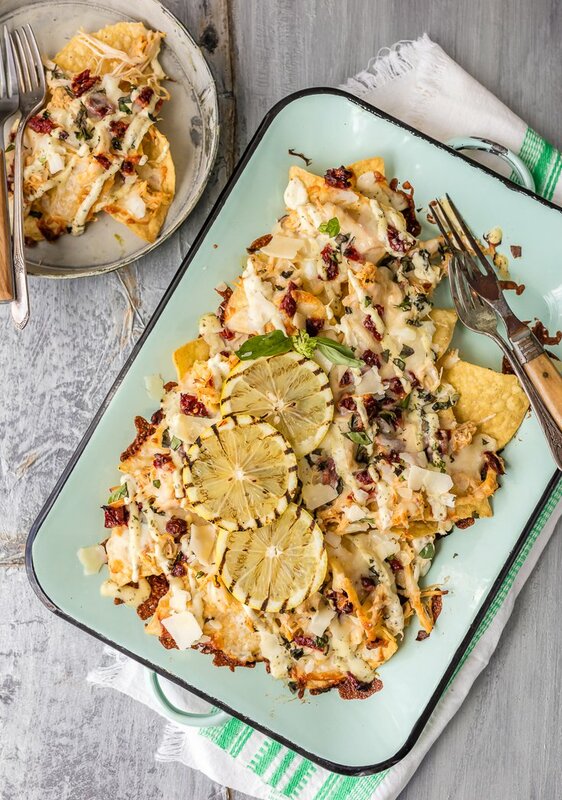 Why not try these Greek nachos for a unique dish? 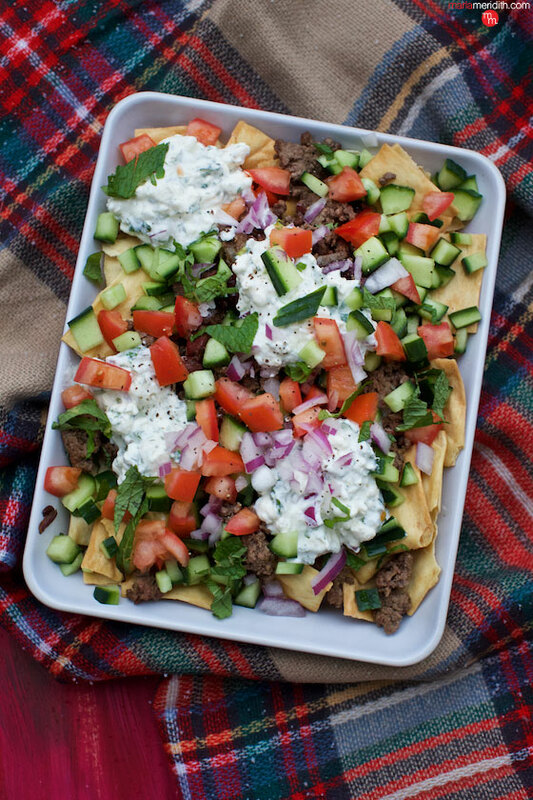 Pita chips, fresh veggies, lamb, and your favorite Greek dressing/sauce- not only would these be tasty, but they’d probably be a little more friendly on your waistline ;). And just changing up the toppings a little can have a huge impact- grilled pineapple, red onion, barbecue sauce and jalapenos- simple, but I imagine this has got to be SO delicious! Or who says you have to use regular boring cheese sauce? ;) I might be the world’s biggest fan of alfredo, and I’m sitting here drooling thinking of translating it into a nacho form! The picture above added chicken, basil and sun-dried tomatoes; I’m thinking a chicken bacon version would be so good. 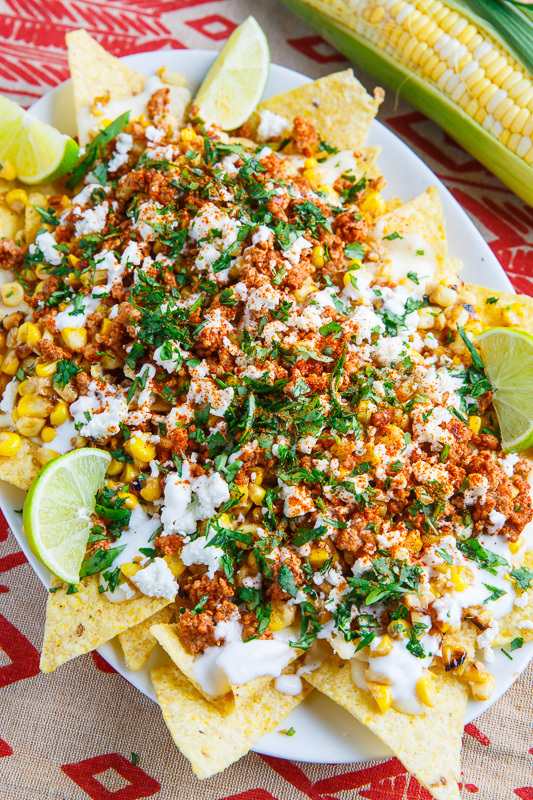 And while we’re talking about creative sauces, if you’re a fan of mexican street corn, have you ever tried it in nacho form? This looks amazing! 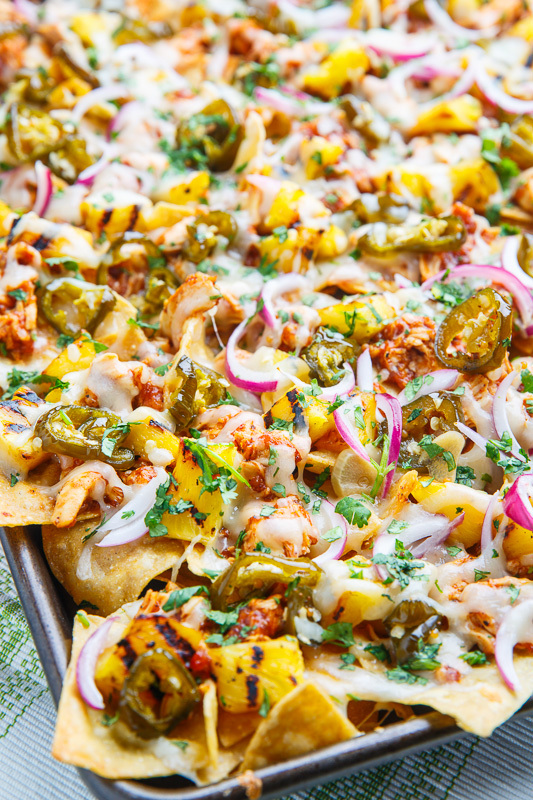 Really, there are no rules when it comes to nachos. Who says you have to use tortilla chips as a base? Cheese, bacon, green onions, ground beef, jalapenos- would any of these things not be amazing on top of french fries or waffle fries? Sounds pretty divine to me! And you can always think sweet! Cinnamon chips are tasty enough by themselves, but serve them with a fruit salsa and whipped cream and they truly become heavenly! Or try another variation- strawberries with chocolate sauce and whipped cream- so so good. You can even forget the chips and use apples to create your own caramel apple nachos! 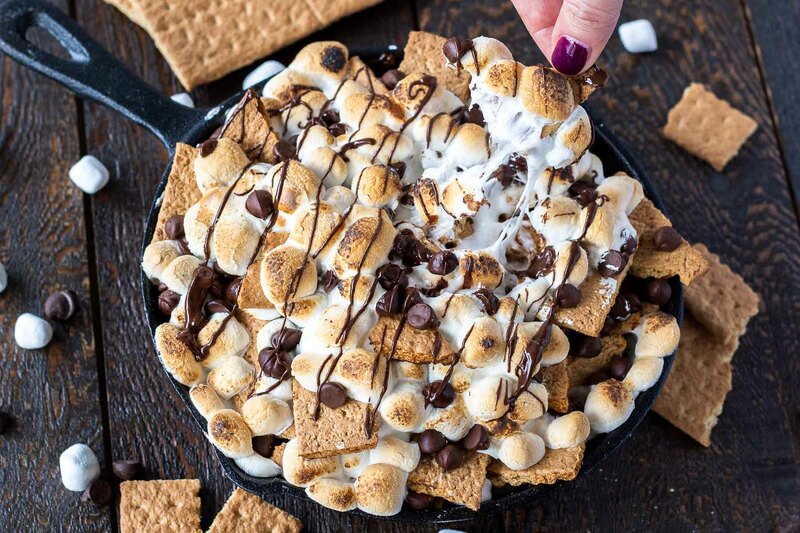 Or try a s’more variation like the one pictured above- graham crackers, chocolate sauce and marshmallows- one of the most perfect combinations ever! Do you nacho at your house? What’s your favorite recipe? Are you intrigued by any of the ones listed above? Share your thoughts in the comments below!